Since the early 1900’s, ultrasound technology has been used to visualize the invisible, detecting everything from metallurgical flaws to human gall stones. Today, in veterinary medicine we routinely use ultrasonography in various applications, as both a diagnostic and therapeutic modality. Even better – where once we had to bring the horse to the machine, now can bring the machine to the horse with highly portable laptop sized units, enabling us to image multiple aspects of the horse’s anatomy conveniently in the barn. What is Ultrasound Imaging Used For? 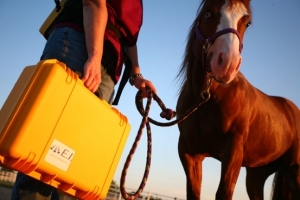 As equine veterinarians, the size of our patients presents many challenges, and diagnostic imaging is no exception. 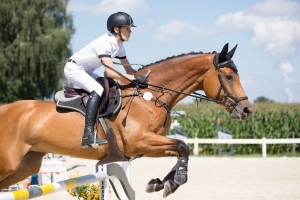 Where humans and dogs can be imaged from head to toe with either an MRI or a CT scan, a horse is limited to the legs, head, and neck areas as these modalities cannot penetrate the body of the horse. While radiographs (x-rays) of the legs and head of horses is a tool used by every veterinarian, radiographs cannot generate strong enough x-rays to penetrate the massive body of the horse either. The limits of these imaging modalities are why we often turn to ultrasound, as it allows us to image both the body and the soft tissues (tendons, etc.) of the limbs in a convenient and portable package. Let us say your 12 yo jumper comes off a tight turn from a combination and hits some boggy footing at the base of the next jump, showing up a little bit off. After a few days of rest, anti-inflammatories, and cold therapy, he still doesn’t seem 100% sound and you call the vet for a lameness exam. During an ultrasound exam, your veterinarian will fully evaluate and examine the area in question, including tendons, ligaments, joint capsules, and occasionally bone. Ultrasound gives the experienced examiner the ability to see a very detailed image of these tissues, and detect small abnormalities which could be causing pain or lameness. Once identified, the lesions can be monitored by repeated ultrasounds over the course of recovery and rehabilitation. 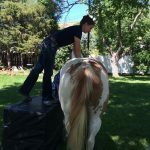 Monitoring the healing process allows veterinarians to develop a customized physical therapy plan suited to the individual needs of your horse. 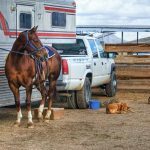 Without follow up exams, it is difficult for your veterinarian to predict the rate at which your horse can return to work, or the prognosis for his full recovery. In the case of severe injuries where additional regenerative therapies are indicated, ultrasound imaging can also be used to specifically place treatment, like stem cells or platelet rich plasma (PRP), directly into the lesion for targeted therapy. 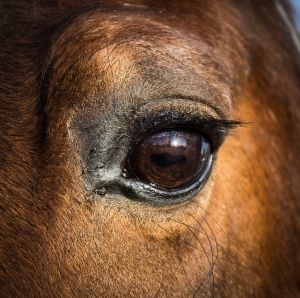 A few additional applications of ultrasonography include general equine medicine, ophthalmology and reproduction. Ultrasonography has been used in human reproductive practices almost since the inception of the initial technology, and the concepts applied to horses have changed very little since its beginning. 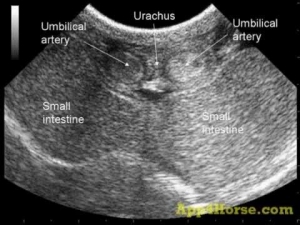 From the initial assessment of a mare’s reproductive tract to the confirmation of pregnancy, ultrasound plays an integral role in the creation of a healthy foal. Ultrasound can be used in acute colic cases to assess GI motility, stomach distension, and general abdominal health. With the invention of stall-side ultrasound units, we can also obtain diagnostic images of a multitude of organs, from the liver and spleen to the kidneys, colon and small intestine. Do you have a goofy gelding who gets his head caught in everything? Ultrasound can be used to assess the integrity of the structures within the eye and even search for foreign objects within the globe. Ultrasound can be applicable in various cases ranging from pneumonia to cardiac insufficiency. We can even watch the blood flow between the chambers of the heart! The applications for such technology are truly endless and are only potentially limited by the size of the horse. Call us to discuss your needs and schedule an appointment.